Maryanne’s musings: Yup, it’s a Halloween special! Sometimes I fall back on similar poses for the horses so I am really happy with the middle panel of three scared horses because they’re all at angles I don’t usually draw. Framing this one up was a little tricky. I would have loved a lot more frames so I could storyboard more expressions and tight shots, but it condensed down ok I think. 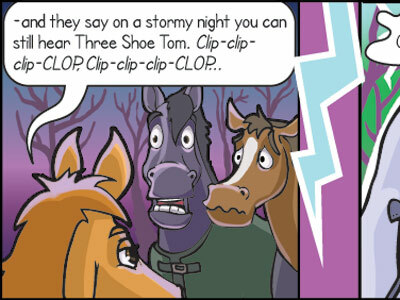 The bit I had to redo and fiddle with (there’s always something…) was the silhouette horses in the last frame. I pondered having 3 because there’s meant to be 3 scared horses, but in the end I decided one had run out of the frame. Also the silhouettes looked quite blobby. They still do, but imagine more blobby.